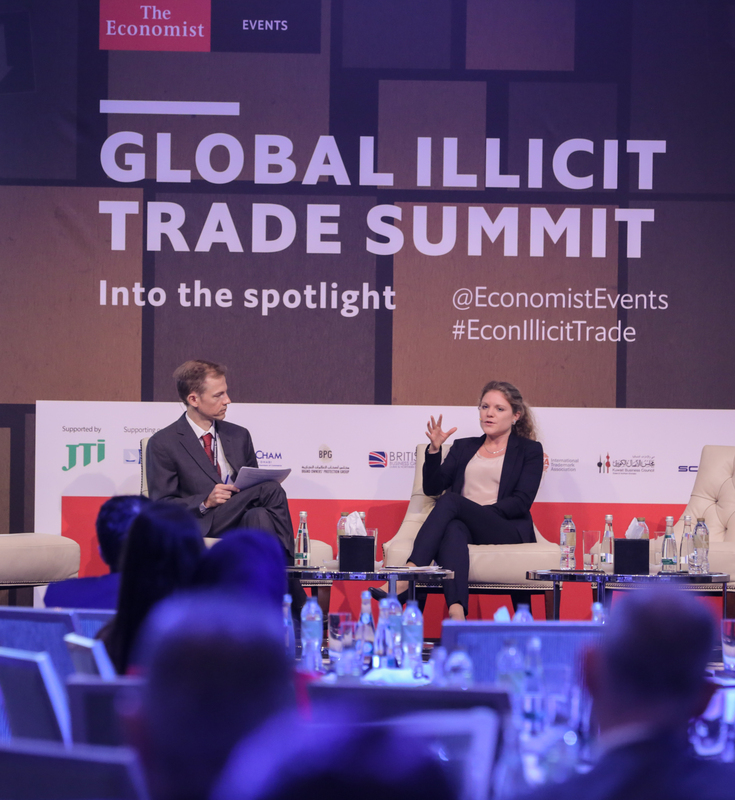 In October 2018 Annette Idler spoke at the Global Illicit Trade Summit, hosted by the Economist in Abu Dhabi, on the links between conflict and illicit trade. The event was reviewed in the UAE national Newspaper. 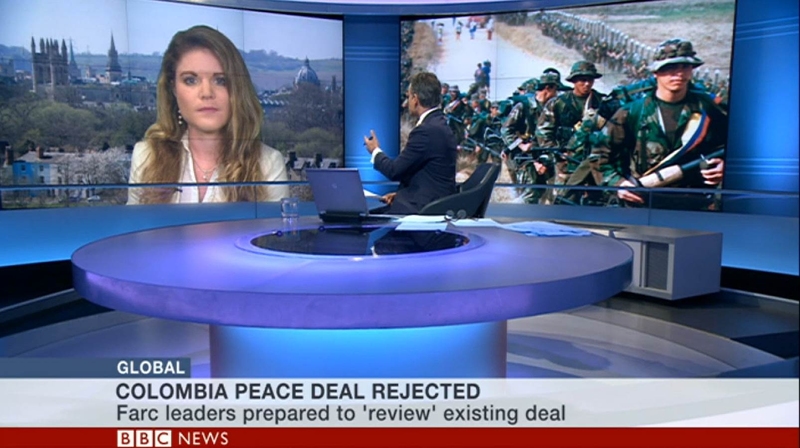 On 23 November 2016 Annette Idler was interviewed by BBC World Service Radio on the revised peace deal in Colombia. You can listen to her contribution here (at 28:00). She also analysed the changes in the peace deal on BBC TV News that day. In October 2016 Annette Idler has made numerous media appearances commenting on the ‘No’ vote in the Colombian plebiscite on a peace deal with the FARC rebels. She appeared on the BBC World Service ‘Newshour’ programme (around 35 mins in), BBC World News (see image above) and twice on Austrian FM4 radio. To access her contributions click here. In September 2016 Annette Idler was interviewed on Colombia’s peace deal. 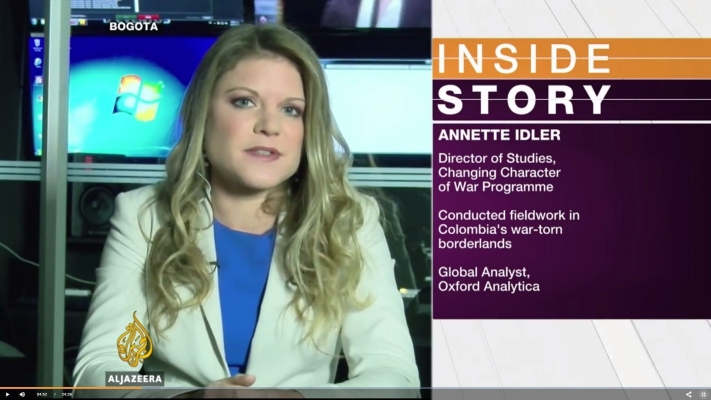 In August 2016 Annette Idler appeared on Al Jazeera’s television programme “Inside Story” to discuss the peace deal in Colombia. Interviews by BBC World Service from 0:57 to 5:30 here and from 2:08 to 6:56 here. In August 2016, Annette Idler was interviewed on the peace deal in Colombia. In July 2016, Annette Idler was interviewed on the relevance of her research for the peace negotiations in Colombia. In July 2016, Annette Idler was interviewed on the Chiloct Report and the Iraq War by the correspondents for London, Paris, Washington, and San Pablo of the two Argentinian newspapers Clarín and La Nación. In April 2016, Annette Idler was interviewed on asymmetric warfare and the changing role of violent non-state groups. In March 2016, Annette Idler was interviewed on the peace process and the challenges for the post-agreement period in Colombia. In November 2015 Annette Idler has been given a Social Sciences Knowledge Exchange Fellowship Award for her project on ‘Putting Frontier Research into Action: Co-designing Security Policies to Tackle Violent Non-state Groups in Peripheral Spaces’. In October 2015 The Conversation published Colombia’s Deal with the FARC could bring peace – or create a power vacuum. On 6 October 2015 Annette Idler presented on “Blurring the Lines between Civilians and Armed Actors: Conflict in Urban Contexts” at MIT, Cambridge, Massachusetts. Event on “The Changing Character of War: Implications for Policy”, Georgetown University Law Center, Washington DC. 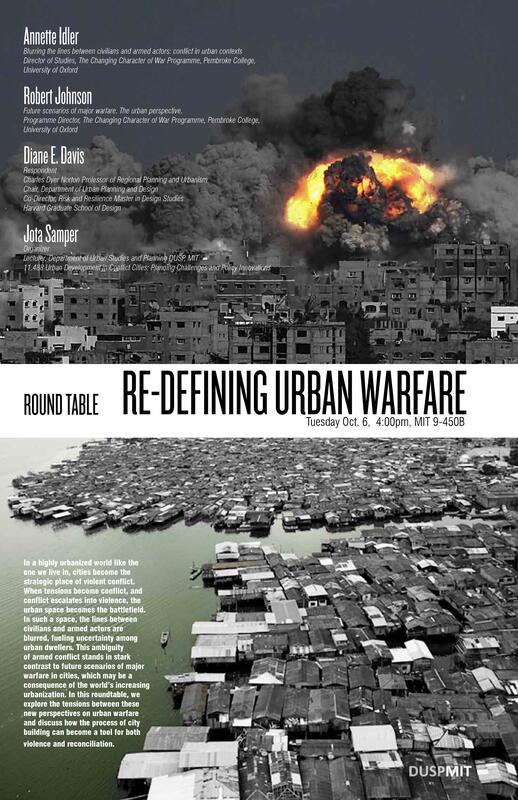 On 5 October 2015 Annette Idler participated in a roundtable event with Oxford University’s “Changing Character of Warfare Programme” and the joint Arizona State University/New America “Future of War” project. On 5 October 2015 Annette Idler spoke on Civil Wars and Terrorism in Washington DC. On 14 September 2015 Annette Idler was awarded the Cedric Smith Prize 2015 at the Conference of the Conflict Research Society for the best piece of UK-based conflict research. On 10 September 2015, The Conversation published “A Humanitarian and Diplomatic Crisis is Unfolding on the Colombia-Venezuela Border”. On 8 July 2015, Annette Idler was interviewed on the impact of violent non-state groups on peace processes and peacebuilding. On 8 July 2015 Annette Idler gave a talk on “Alliances among Violent Non-state Groups: Lessons Learned for Building Peace” at the United Nations Peacebuilding Support Office in New York. Annette Idler wrote a blog post on the Changing Character of War Programme at the University of Oxford for PaCCS. On 24 June 2015, the Canadian Security Sector Reform Resource Center published Annette Idlers’ article (co-authored with James Forest) on “Violent Non-state Actors and Complementary Governance: What ISIS, Hizballah and FARC Have in Common”. On 5 June 2015 Annette Idler’s blog post “From the Field: Intuitive Trust Matters: Researching Conflict and Crime across the Borders” was published by Border Criminologies, a network of the Centre of Criminology, University of Oxford. From 26 to 30 May 2015 Annette Idler participated in a workshop on security and aftercare in fieldwork and presented a paper on fragile alliances among violent non-state actors at the LASA Congress in Puerto Rico. On 21 May 2015 Annette Idler presented a paper on narco-brokers and financiers in the cocaine supply chain at the annual conference of ISSDP in Ghent, Belgium. On 12 May 2015 Annette Idler gave a talk on “Arrangements of Convenience among Violent Non-state Actors” at the CCW Lunchtime Seminar. On 26 March 2015 Annette Idler presented at the Roundtable on “The Road to Peace in Colombia: Illegal Economies and Armed Groups”, organised by the International Institute for Strategic Studies. On 24 March 2015 Annette Idler’s blog post on Narco-brokers and Financiers: the Key Elements in the Cocaine Business” was published by the European Union’s The Cocaine Route Programme: Combatting Transnational Organised Crime. On 25 February 2015 Annette Idler gave a talk on “The Invisibility of Forces (Non-)Migration in Colombia’s Borderlands” at the MIGRALAC seminar. International Studies Association Annual Convention 2015, New Orleans, US. From 18 to 21 February 2015 Annette Idler participated in the ISA Convention. She presented in a panel on “Fragmentation, Alignment And Alliance Formation In Civil Wars” and in a panel on “Conflict Resolution Tools For The Field”. On 19 January 2015 Annette Idler gave a talk on “Fragile Alliances among Colombian Violent Non-state Actors”. She also gave a brief interview on the topic. On 5 January 2015, Annette Idler’s article “Behavioral Patterns among (Violent) Non-State Actors: A Study of Complementary Governance”, co-authored with James J.F. Forest, was published. On 8 December 2014, Annette Idler gave a talk on disrupting organised crime in Latin America at the launch conference of the strategic hub for organised crime research at RUSI, London. On 28 November 2014, Annette Idler participated in an expert workshop in Berlin, Germany, on “Ignoring or interfering? Development approaches to transnational organized crime”, organised and funded by the German Institute for International and Security Affairs, the Federal Ministry for Economic Cooperation and Development and the Global Initiative against Transnational Organized Crime. On 25 November 2014, Annette Idler participated in a high-level workshop on “Countering and Deterring Hybrid Threats” at the International Institute for Strategic Studies in London, supported by NATO Public Diplomacy, the UK Ministry of Defence and the Foreign and Commonwealth Office. Annette Idler co-organises a workshop on “Insecure Spaces in Latin America: Encounters with Violence and Drugs”. The event will be held at Queen Elizabeth House, University of Oxford on Thursday, 27 November 2014. There are a very limited number of places available for postgraduate students and researchers who wish to participate. If you wish to join, please contact her by 5 p.m. on Monday, 24 November 2014. Please include your name and affiliation, reason for interest in attending, and how the workshop theme relates to your own work. 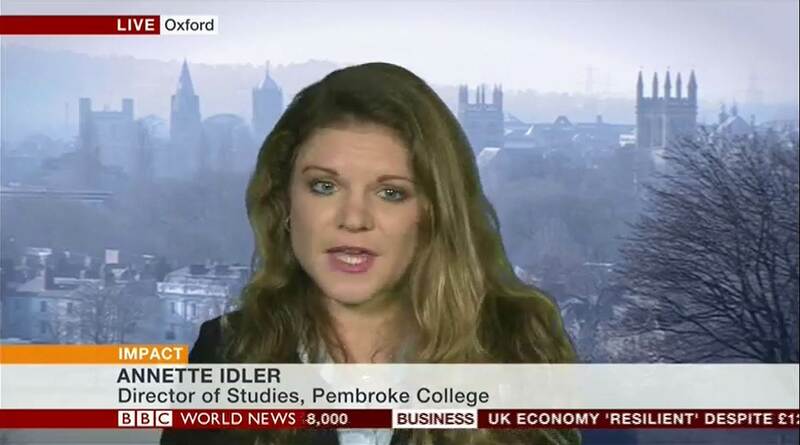 On 14 November 2014, Annette Idler presented on her doctoral research at the Department of International Development, University of Oxford. Annette Idler is now affiliated as a Research Associate with the Centre on Conflict, Development and Peacebuilding at the Graduate Institute Geneva. On 25 and 26 November 2014, Annette Idler was invited to give a talk on “The Drug Market and Current Policing Responses in Latin America” at an expert seminar organised by Chatham House, the International Institute of Strategic Studies and the International Drug Policy Consortium in London. On 30 October 2014, Annette Idler gave a talk on “Fieldwork in Hot Places: Personal and Methodological Challenges for Female Researchers” and a seminar on the violent impact of alliances among violent non-state actors at the University of Leeds. On 25 and 26 October 2014, Annette Idler participated in and gave a talk on transnational organised crime in fragile contexts in cooperation with the German GIZ and the Federal Ministry for Economic Cooperation and Development at the Heidelberg Dialogue for International Security, Germany. On 21 October 2014 Annette Idler was interviewed on development and peacebuilding in Colombia’s border areas the University Francisco de Paula Santander, Colombia. On 21 October 2014 Annette Idler gave a lecture on “Development in Borderlands: Hope for Peace” at the University Francisco de Paula Santander, Colombia, and participated in a panel on peace and “post-conflict borderlands”, organised by the University Simon Bolivar, Cúcuta, Colombia.